Baltimore, MD (January 21, 2019) – Fifth Estate Entertainment is proud to announce the mind-blowing, face melting, nothin’ but a good time, audience favorite ROCK OF AGES will return to the stage with a tenth anniversary tour. Nominated for five Tony Awards® including Best Musical, the all new production will play Baltimore’s Hippodrome Theatre as part of the 2018/19 CareFirst® BlueCross BlueShield Hippodrome Broadway Series from February 15-16, 2019. Tickets are on sale now! To purchase, visit Ticketmaster.com, BaltimoreHippodrome.com, call 800-982-ARTS, or visit the Hippodrome Box Office located at 12 N Eutaw St, Baltimore, MD 21201 at the corner of Eutaw and Baltimore St. Discounted group orders of 10 or more may be placed by calling 443-703-2401 or contact Andrew Springer at Andrew.Springer@broadwayacrossamerica.com. It’s 1987 on Hollywood’s Sunset Strip when a small-town girl meets a big city rocker. 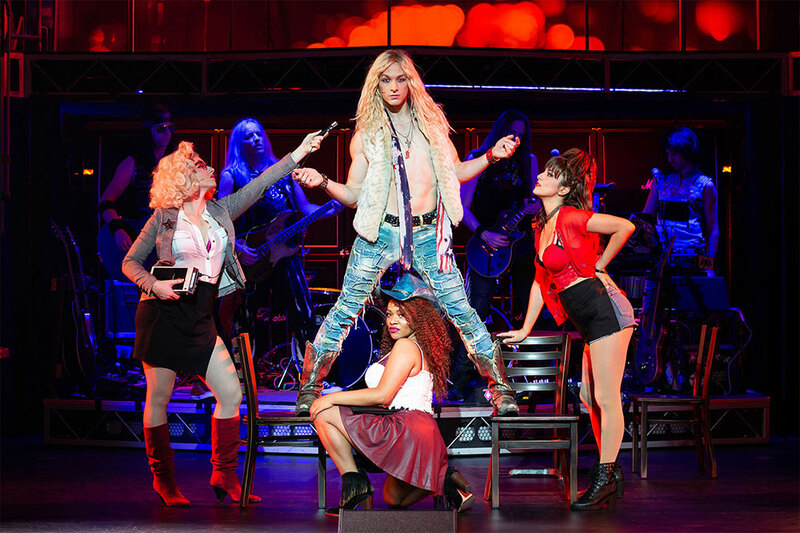 As they fall in love in L.A.’s most famous rock club, ROCK OF AGES allows fans to rock out once again to their favorite ‘80s hits. Featuring the music of iconic bands such as Styx, Poison, Twisted Sister, and Whitesnake among many others, this Tenth Anniversary production features a dynamic new cast revisiting the larger than life characters and exhilarating story that turned ROCK OF AGES into a global phenomenon. ROCK OF AGES opened April 7, 2009 on Broadway and played more than 2,300 performances at the Brooks Atkinson and Helen Hayes Theatres earning five Tony Award® nominations including Best Musical. The show also enjoyed successful national and international tours and, in 2012, was turned into a major motion picture by New Line Cinema and Warner Bros. Pictures. With a book by Chris D’Arienzo and arrangements and orchestrations by Ethan Popp, the tenth anniversary tour is being directed by Martha Banta and choreographed by Janet Rothermel. The CareFirst® BlueCross BlueShield Hippodrome Broadway Series is presented in partnership with THE HIPPODROME FOUNDATION. The Hippodrome Foundation, Inc. is a 501(c)3, non profit organization established in Baltimore, Maryland in 1976. Formerly known as the Baltimore Center for the Performing Arts (BCPA), the foundation was created to present live theater at the Morris A. Mechanic Theater. Over the years, HFI has evolved into its present incarnation as the largest presenter of Broadway in Maryland working in partnership with Broadway Across America to bring in the very best possible shows.